In Enjoy your massage! you have just been hired as an apprentice masseur of Giselle's beauty farm, one of the most famous in the city. Learn new relaxing massage combinations and apply them on your stressed customers! As an apprentice, you'll have to do your best: if your client gets angry, no one will save you from losing your job, but if you prove to be able, you might even become the director of the whole beauty farm! So what are you waiting for? Six clients are waiting for your help, you are the only one who can help them! 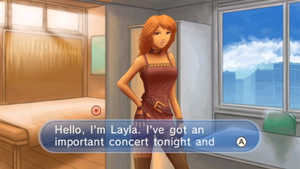 In the first cutscene, the graphic for Giselle appears in place of Layla. 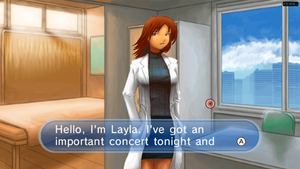 Giselle appears in place of Layla. Layla appears on real hardware. The graph below charts the compatibility with Enjoy your massage! since Dolphin's 2.0 release, listing revisions only where a compatibility change occurred.